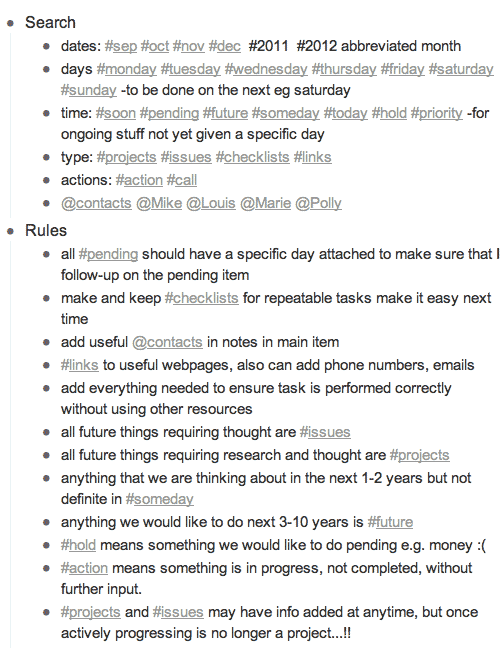 Stephen Pickering sent us an email explaining his approach to tagging in WorkFlowy. We thought it was pretty interesting, so we might as well share it. In the relatively near future, we’ll make Stephen’s job easier by having WorkFlowy compile tag lists for you automatically. No technology, though, can free you from choosing a system to organize yourself and sticking to it, and Stephen’s rules seem pretty useful. Next Post Meet your new friends: Undo & Redo. Reblogged this on Edtech Box. Timeline for the auto compile tag list?